My version 2.0.0.3003 on XP , with no interference from me , has just now given a pop-up from the tray icon saying all details at 0% and turned the icon red . I opened the GUI which showed 0% and no programmes listed but indicating a scan was in progress . It completed normally and gave me 100% and green icon . There is no "secure browsing" module available from the Dashboard and there is no history displayed except one green column for "now" . In settings , I found the "enable secure browsing" had been unchecked (not by me) ; I rechecked it and the "secure browsing" display is back . I am shown as an "unregistered user" and my "Secunia Community Profile" is blank . Too busy to try and reset my ID for now . Will look at it again tomorrow . A bit of a pig's breakfast , if you ask me . Post "RE: Weird goings on with the PSI " has been selected as an answer. Evening Anthony....this won't be of any help......possibly commiseration might be deemed more comforting ?! My psi....version 2.0.0.4003.... has been on and off for the last 7/10days.....usually just getting to "verifying internet" and no further. Tho' I've also experienced.....at the same time of that happening.....my browsers in slow motion....and sometimes havn't been able to reach site either. Very erratic. Tho' occasionally the icon would be green and be the signal that not just Secunia would run smoothly. I've just put it down to remote server problems. Tonight, with both Chromes at 18 and everything tickety boo. I have written to Support today asking for a comment on this thread which has a similar type issue. I think yours is Profile related but ......! No response yet so assume they are busy elsewhere. Hopefully they can update us on what is causing these minor hiccups. 2.0.0.3001 - Windows XP SP3 32 Bit with IE8 via remote hook up to one of my students. I installed version 2.0.0.3003 onto this PC & checked around. All appears normal in all cases. Not sure U should be looking at the server for your ills over the last few days. If I remember correctly U are running a BETA version of Google - have U checked it is not that? Have U reported a POSSIBLE bug to them for a response? Have U completed a diagnostic test on your ISP line? Have U tried to optimised your broadband link with one of your cleaners? Did U not get a result when U "pinged" the Secunia IP address during your "breakdowns"? Version 2.0.0.4003 has worked flawlessly on my test machine using IE9 during the whole period. Maurice and Anthony...........thankyou both for the input/advice/comment. I seem to be on a bit of a roll.....over 24hrs and 3/4 bootups and all behaving as if nothing ever happened !! Both Chrome Dev and Canary are set to automatically send crash and usage reports to Google. I tend to use Canary more than the Dev.....it seems to have the edge....a version change; I don't seem to be able to dwell on "old" faults !! There's been no optimization of the BB link to my knowledge....tho' I do still continue to use my CCleaner etcetera as I've done for the last 2/3 years. Didn't "ping" Secunia IP.....Will certainly bear it in mind to act upon at any future occurrance. All three of my browsers exhibited the same symptoms at the same time as psi being down....some sites were still accessible and with speed. I've had the same symptoms on at least two occasions over the last 18 months....all having resolved themselves after a few days. One thing I did discover in checking thro'......I think I referred to it in a post a few weeks ago.....as both Chrome are set to check for server cert. revocation ; I wasn't overly perturbed at having left..as I thought...the check out of "Check for Server Cert. Revocation ". I found the checkmark in place. I decided to leave it as it was....psi is also now working as it was. It's always slow goin' thro' roadworks ? A full scan ran normally but no sign of my history returning to the "dashboard" - merely a green column for "now" . I also noted that whatever happened the other night , today , only my "C" partition was checked for scanning , the "D" having become unchecked . Will wait to see if Secunia have any comments next week . apps-nothing found. Tried uninstall, reinstall, reboot, no joy. Following the above thread for some direction it seemed as though a corrupted Profile might be the clue. Downloaded v1.5.0.2 & saved to Desktop, uninstalled PSI using Revo Uninstaller Pro in the Advanced mode as this exposes the Registry keys which the PSI uninstaller/installer doesn't touch. Removed all Secunia keys-BINGO. Installed v1.5.0.2 using the same Revo program & PSI started a scan when install finished. Ignore rules for my D: drive(recovery). up-to-date but still has vulnerabilities(as always)but why show them under the Secure Browsing tab? as I've used the PSI forever-no go-just Now & 1 week ago. is having some weird issues, maybe this might help. I see Secunia has made no comment(s) here on the thread. It will show as patched in the Scan Results Page because there is no update from Adobe available. The Secure Browser Page (for advanced users) will tell a different story by giving more details. On that basis U can limit the use of Flash - In IE just activate ActiveX Filtering (Tools>click on ActiveX Filtering>this will put a tick (check mark)to the left) - that will stop it running unless U authorise it. Are U mistaken about 3 Browsers? U should have IE & Firefox - Secunia have recently added a standalone Flash entry which is not a browser. Unsure why they have done that - maybe because Flash is mostly vulnerable! Please also note that PSI version 2.0.0.4003 has a Secure Browser bug in that it does not populate all the browsers add ons. I've looked in my IE Tools/Internet Options/Advanced but can't find the reference to ActiveX Filtering. Have I looked in the wrong place, please? Also Secunia have recently added a standalone Flash entry which is not a browser. Unsure why they have done that - maybe because Flash is mostly vulnerable! I'd actually uninstalled Flash after the latest scares then reinstalled it as I remembered that Secunia needs it. Are you saying that we can uninstall it on our PCs without affecting Secunia? Sorry - I should have made it clear I am talking about IE9 for filtering. All versions of PSI work without Flash. Version up to & including 1.5 series require Flash if U want to see the pretty graphs on the Overview Page. The version 2 series do not require Flash at all. The primary functionality of PSI is not affected by Flash. screen-it would never connect. Saw this thread http://secunia.com/community/forum/thread/show/119... & followed it for several days to see if a 'fix' was found. I'd already checked [...] I see Secunia has made no comment(s) here on the thread. We have identified an omission in the process that deletes inactive users. This has caused active users of certain versions of the PSI to be deleted erroneously. We have fixed the error. Since the user data has been deleted, it is unfortunately necessary to uninstall the PSI and install it again. Please let us know if uninstalling and then downloading and installing the PSI again should not solve the issue. @ Maurice. Thanks for that. 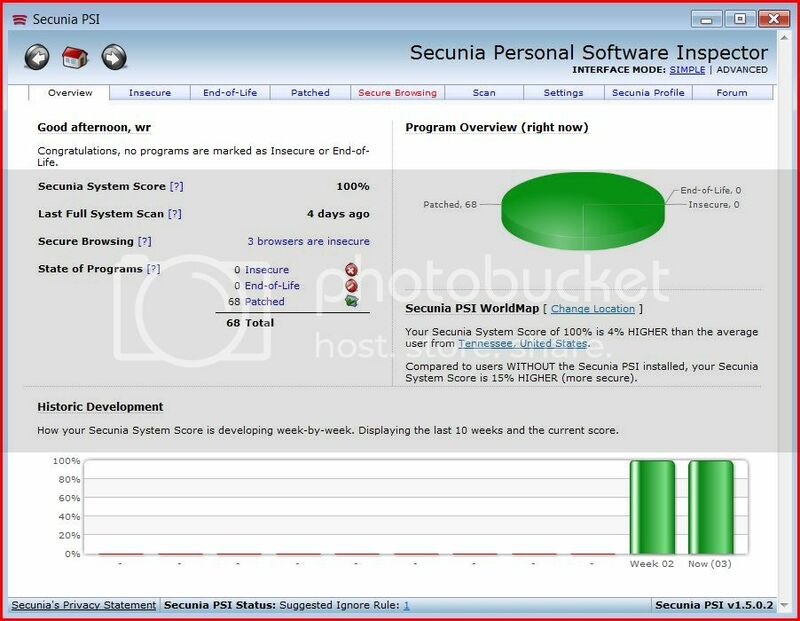 PS My Secunia icon is now red, although 100% score. Not a problem for me now I know it's apparently quite a common thing at the moment. PPS And it's now turned green as I'm keying! @Maurice Joyce Thanks for your comments regarding this issue. Yes AFP means Adobe FlashPlayer-poor wording on my part-I meant that I had v11.1.102.55 both ActiveX & NPAPI last stable available from Adobe. I notice through Filehippo there are Beta versions available-I don't use betas of any program. Regarding 3 browsers this was on the Overview page-3 browsers listed as Insecure for browsing. Opening the Secure Browsing tab (in the ADVANCED MODE) 4 browsers were listed-AFP(ActiveX)bordered in red, AFP(NPAPI)bordered in red, IE8 bordered in yellow, & Ff bordered in green. Why Secunia chose to put the 2 AFP in the Secure Browsing tab-no idea-unless as you state to bring attention to the programs being highly vulnerable. Another good reason why I use the NoScript program for Ff. @bjm thanks for sharing the email from the Secunia official. As stated in my previous post uninstalling/reinstalling via Secunia didn't work. Only after using Revo Uninstaller Pro & finding the (corrupt) registry entries & deleting same did I get the PSI to install & properly function. Last scan seems to have properly completed-I now only show 1 browser as Insecure on the Overview tab, & when opening the Secure Browsing tab only 2 browsers listed IE8 bordered in yellow & Ff3.x bordered in green. The only thing missing is my History-only 2 green 'cylinders' NOW & 1 week ago. But I can live with that. Thanks to all who gave comments/possible solutions, & to Anthony Wells who started this thread & I hope has his problems solved too. Until the next 'glitch' see y'all. Last scan seems to have properly completed-I now only show 1 browser as Insecure on the Overview tab, & when opening the Secure Browsing tab only 2 browsers listed IE8 bordered in yellow & Ff3.x bordered in green. The only way we can recommend that you solve this, is by updating to the latest version of the PSI. The only alternative would be to make a change in the registry which we cannot recommend. At a loss why update to latest version 2.0 will fix hang. An update from 1.5 to latest 2.0 will run uninstall / install which apparently does not touch the registry. My simple uninstall/reinstall of PSI 1.5 dropped out reported Flash Player vulnerability. The Flash Player vulnerability that had previously appeared in Secure Browsing has taken a powder. Confused as to why Flash Player unpatched vulnerability is not listed in Secure Browsing ? Text in Secure Browsing still reads 4 even though 2 for Flash Player (IE & FF) have vanished. Quote > Secure Browsing: Once you can cross off all 4 from this list, you can rest assured that automatic attacks such as drive-by installation of malware through your browser are a thing of the past. Curious, now that you have PSI functioning properly. Does your PSI report Flash Player advisory. PSI doesn't list either AFP(ActiveX or NPAPI) in the Secure Browsing tab either-as you say "took a powder". Neither does it list 4 browsers only the 2 I have installed. Also when in the Patched tab if I click the Cat 4 'bars' I'm sent to SA 46818-dated 11-11-2011! No SA number listed beside Cat rating as usual. I'm at a loss as to why upgrading to v2.x from 1.5x would 'cure' the hangup problem. I know from previous 'lurking' that I can't remember Secunia ever recommending to change anything in the registry except maybe to set a default browser. I'm like you I didn't think the PSI uninstaller touched the registry-maybe v2.0 overwrites some of the registry keys? Staying with Ff3.x just because it 'works'. Tried v8 after it was out for 2-3 weeks & just couldn't get used to it. EDIT: meant to also say that the above SA relates to v11.0.1.152-I have v11.1.102.55. I may be able to shed some light on the issue. 1. Although still available for download version 1.5 is not officially supported. On that basis I assume Secunia Support have told U to upgrade where support is available. 2. Version 2.0.0.4003 has a well known (reported} bug in that the Secure Browsing Page does not populate correctly with all the Browser Add Ons. 3. The Secure Browsing Tab should only list the browsers that are actually installed on a PC. Not entirely sure what is meant by 4 browsers but only 2 showing. If U have 4 browsers installed they should be listed including any 64 Bit versions. 4. Flash should be showing as patched on the Scan Result Page. This is correct in that the user is up to date but awaiting a hotfix from Adobe. From the tests I have just completed Flash has been removed from the Secure Browsing Page on versions 1.5.0.2,2.0.0.3003 & 2.0.0.4003 - I can only assume Secunia Support are working on how to better present Flash for users. HKEY_CURRENT_USER>Software>PSI - this is the user ID area. 6. If U are keen to keep tabs on your browser(s) U can always use Qualy. The FAQ & how it works should be read prior to any scanning. For example,if you use more than one browser U must use the scanner on EACH browser. It only supports IE,Firefox & Google. I was able to get PSI installed & running from my two Admin user accounts. I hope the link above 'works'-this is what I meant by 3 browsers Insecure when I only had 2 installed. Sorry I was distracted & didn't get a screenshot of the Secure Browsing tab showing the 4 'browsers'. Yes thanks Maurice Joyce for the confirmation about AFP being removed from Secure Browsing tab. Thanks also for another 'bullet' (Qualys) in the arsenal against the 'bad guys'. @bjm- Hope all things PSI are now working for you as expected. I can't take all the credit though as I followed your thread about PSI never verifying connectivity & I think another thread started by xerces8-not sure of thread title or if that's correct users name. Anyway-we're getting there. Also I do not have the text as you do in the Secure Browsing tab regarding the 4 browsers. @bjm-thanks for 'heads up' on link. http://i737.photobucket.com/albums/xx12/WR_P/Captu... This one should work(fingers crossed). Adobe Flash Player Insecure returns to Secure Browsing tab. Once you can cross off all 4 from this list, you can rest assured that automatic attacks such as drive-by installation of malware through your browser are a thing of the past. I have two browsers and both Secure Browsing box's IE & FF list both Flash plugins ocx & dll. Seems like the IE Secure Browsing box should only list Flash plugin ocx and the Firefox box should only list Flash plugin dll. The 4 = 2 for each browser box. 2x2 = 4 D'oh! Havn't you got a 1,2,3,4 list above "Once you can cross all 4 off the list "? It refers to (1) Make sure browser is up to date. (2)Progs and plug-ins (3) Unpatched vulnerabilities (4) Don't say Yes, Run etc if you don't know exactly what it is. 4.Be careful and vigilant. Don't accept anything - don't ever say "Yes", "Run", or "Install" to anything if you don't know exactly what it is. I'll go stand in the corner now and reflect on how stupid I R.
Of course you're correct. D'oh! Have you got your new specs on ? Is the lighting adequate ? Is screen resolution right ? Have you developed a blind spot with being in the corner for only a couple of minutes ? Is your optician an attractive/distracting female/feminine ? Have you had the cataract test ? Are you sitting too close or too far from the screen......what feels comfortable ? Have you been checked for sugar diabetes ? Is your male/masculine doctor attentive or seeming overly affectionate and off putting ?!!! I agree with mogs: plenty of other reasons-I thought maybe your NoSquint or whatever add-on you use had suddenly gone astray. I have noticed a significant increase in the frequency of those so called "Senior Moments"
Maybe, I need to clear my cache, defrag and reboot. As we get older our memory gets longer.....and we may not have the room that Nellie had in her trunk ?! I packed in reading newspapers thirty years ago....I usually have cereal for breakfast.....I'm always "defragging".....I either remember or don't, but havn't learned to rely on lots of boxed and markered photos in the attic !! My mother can keep my old train set !!! In my absence , it looks like this thread has turned into "weird users" of the PSI ; to quote Hunter S Thompson , "it never got weird enough for me" . My "History" has not been returned and is "weakly" rebuilding itself : this is of no consequence and I will leave any "reinstalling" of the PSI until another time . Otherwise everything normal other than the tray icon going awol and then reappearing after it got a reboot in the proverbial .